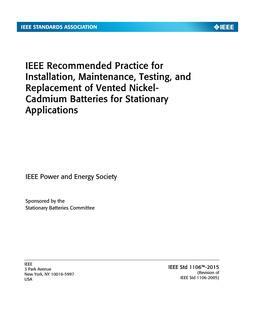 This recommended practice defi nes the areas of recommended knowledge for installers and maintainers of stationary standby batteries (primarily lead-acid and Ni-Cd standby batteries) and related systems to the extent that they aff ect the battery, personnel safety and reliability of any related systems. Designing the dc system (including any connected ac inverters) and sizing of the dc battery charger(s) are beyond the scope of this recommended practice. While some of the battery information covered by this practice applies to small off - grid cycling applications, information relative to large energy storage cycling applications is limited. 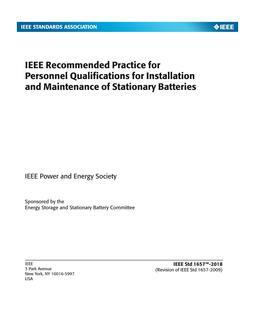 The purpose of this recommended practice is to provide an outline (curriculum) of the necessary items that should be covered by training programs for stationary battery installation and maintenance personnel. The order in which the items in this document are covered is at the discretion of the training developer/provider. Revision Standard - Active. The areas of recommended knowledge for installers and maintainers of stationary batteries and related systems, to the extent that they affect the battery, are defined in this recommended practice. Design of the dc system and sizing of the dc battery charger(s) are beyond the scope of this document. Only lead-acid and nickel-cadmium battery technologies are covered in this recommended practice. An outline (not necessarily in training order) of the items that should be covered by training programs for stationary battery installation and maintenance personnel is provided. Certifying trained personnel and providing its own battery technician training programs will not be performed by IEEE.